I have fond memories of waking up early on Thanksgiving to help my dad in the kitchen. We always watched the Macy’s Thanksgiving parade while we cooked up a storm. My favorite job was helping my dad make his famous potato rolls. This year we are making my dad’s potato roll recipe with a kick of fresh rosemary. Potato rosemary rolls are the perfect addition to any Thanksgiving table. My dad’s potato rolls are my favorite part about Thanksgiving. They are so good, especially hot out of the oven. Nothing beats a freshly baked roll. Mmmm! These potato rolls are soft, tender, and even better with a dab of butter. We always make them in clover leaf form, but you can make them in regular dinner roll form if you wish. The fresh rosemary is a nice addition to my dad’s recipe. The rosemary isn’t over powering, but adds a nice herb flavor to the rolls. Make potato rosemary rolls this year for Thanksgiving. Your house will smell amazing while they are baking and your guests will love them. Side note-we spent the last five days in California. We had so much fun. We attended a blogging event, went to Disneyland, and toured LA. I will be posting about our trip on our “On the Side” page this week. Make sure you subscribe to Two Peas and Their Pod so you don’t miss a post! 1. In a small bowl, put the yeast in the warm water and stir with a spoon. Let sit for about five minutes or until the yeast starts to bubble. Scald the milk and let it cool for two minutes. 2. In a large bowl, mix together sugar, shortening, and salt. Add the milk and stir in one cup of the flour. Next, add the yeast mixture and the beaten eggs. Add the mashed potatoes and rosemary and stir. Stir in the remaining flour until the dough comes together. 3. On a lightly floured surface, knead the dough until smooth, about 5 minutes. If the dough is too sticky, add a little more flour. Place the dough in a large greased bowl and let rise in a warm spot for about 45 minutes or until doubled in size. 4. Punch down the dough. To form the rolls, pinch off about a 1/2 tablespoon of dough and roll into a ball. Place three balls into a greased muffin tin. Continue forming rolls until dough is gone. Let the rolls rise until doubled in size, about 30 minutes. Bake rolls at 375 degrees F for about 15-17 minutes or until golden brown. Remove from oven and serve warm. Those are some of the most perfect rolls I’ve ever seen. I just want to devour one with that slab of butter. There’s nothing more delicious than fresh rolls!!! These look incredible! Beautiful! Those smooth and flavorful rolls look to die for. I seriously want to reach through my monitor. I can’t deal. I absolutely love the flavor of rosemary with bread. I went to college in New York, and used to walk a few blocks over to this bakery, where they made a to DIE for rosemary ciabatta. I would use it for everything: grilled cheese, toast in the morning, cold cut sandwiches… I once made stuffing with it. Out of control. I can’t wait to try these rolls! Thanks for stirring up the memory of my love affair with rosemary ciabatta. These looks awesome. They’re perfect! 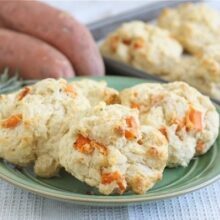 I’m loving rosemary lately – I actually just posted a biscuit recipe with rosemary! These rolls would make a perfect addition to any Thanksgiving meal. They look incredible. Super gorgeous and fluffy, I have a feeling I could eat a LOT of these! Oh my word! Those look so soft and buttery. I’ll take a tray please just for myself, forget the guys they’re on their own. These look delicious. Perfect for a traditional holiday feast. Happy Thanksgiving! These look absolutely delicious! I would love these on my Thanksgiving table! Oh my. I am required by my family to make the very same bread every year. It’s delicious and beautiful, but I would really prefer to eat these beauties. Your site is looking so wonderful Maria! 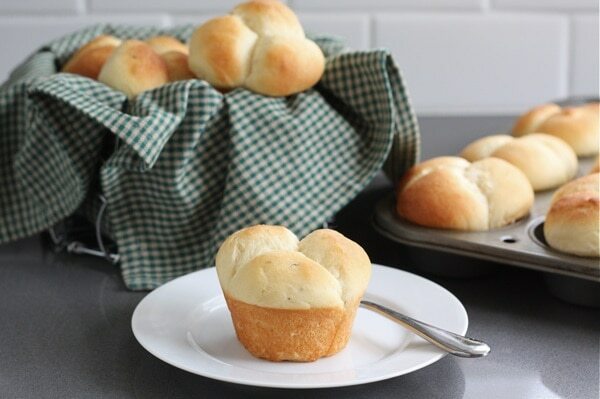 Potato rolls are, hands down, my favorite…they are so fluffy and soft! Yours look delicious! Oooh, I’ve never made my own potato rolls, but these look so awesome, I might have to change that 🙂 Perfect dinner roll! hey girl – what altitude are you at? either way, do you know how to adapt this to high altitude? i would LOVE the make them but i still haven’t figured out the altitude baking at all! LOVE Rosemary! The perfect addition to a roll. PS Read my blog Wednesday. I’ve got some cookies I’m posting that made me think of you when I made them! Beautiful pictures Maria! It’s amazing how certain things remind you of times in your life. Love the story of how these remind you of your dad during Thanksgiving. These rolls look delicious. I love bread so I’m looking forward to trying them. Have a wonderful Thanksgiving! Looking forward to hearing about your trip to LA. Sounds like it was a lot of fun! omg these look awesome!! I will have to try these for sure. Happy Thanksgiving to you! What a wonderful family recipe! These rolls are absolutely beautiful, and perfect for Thanksgiving. I’m glad you had a great time in California – There are limitless fun things to do and see. I may not be a native, but I sure do love living here! Ok, these are the prettiest rolls I’ve seen! Nice job girl! I absolutely love potato rolls and with rosemary, wow wee! I can’t wait to try them. Hope you have a wonderful Thanksgiving! I bet those potatoes give these rolls the best texture!! Would love to be at your house while these are in the oven & for sure when they come out! These sound great! I love bread, rolls, etc. of any kind. 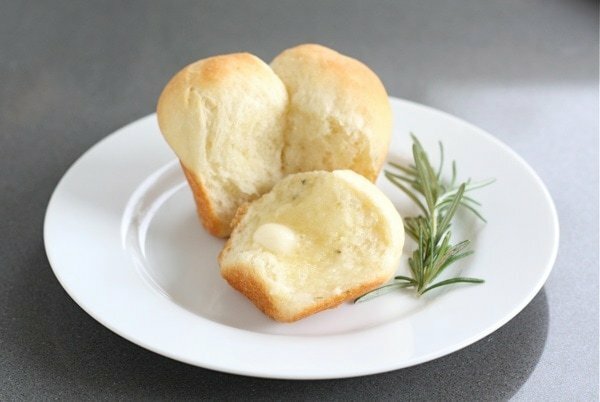 I love the clover shape of these rolls and I bet that hint of rosemary adds such a nice flavor! I love how you took a classically delicious potato roll and added the flair of rosemary. Fantastic! And thanks for the link to the Lion House Rolls – I might even try the rosemary trick with those for a change. mmm, I love homemade rolls. We never seem to get them on the table for Thanksgiving so I will just have to try harder this year! I have an award for you on my blog, I hope you will accept it! 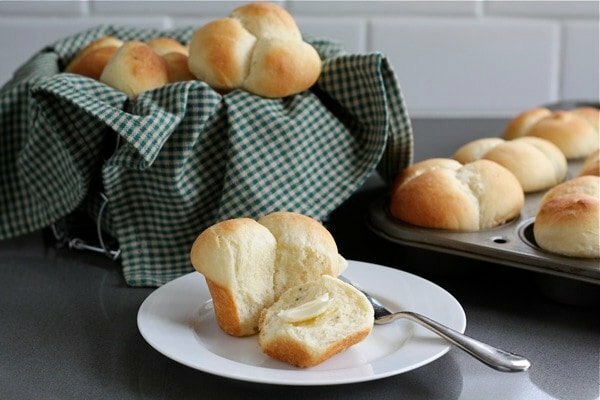 Those look so soft and buttery – my kind of rolls! And I see a glimpse of your new kitchen. Can’t wait to see it all! Just finished making my Thanksgiving rolls this afternoon (going to freeze them, then bake them on Thursday.) I so wish I would have thought to add some fresh rosemary. These look sensational! Freezing and baking is a great idea! Happy Thanksgiving! Thyme would be great as well. Any herb would be nice, use your favorite! Mmm, these rolls do look like perfection. Soft . . . buttery . . . heavenly . . . Apparently we are on the same wavelength bc we both posted rolls on our blog this morning!! I hate to admit it, but I think I would gladly eat an entire basket of these rolls. They sound and look perfect!!! They look and smell delicious. I really want to make them this Thanksgiving. Is it possible to use butter instead of shortening? My dad has always used shortening, but I am sure butter would work as well. Let me know if you try them. Happy Thanksgiving! Looks/sounds lots like BBA rolls made last week. wish I had included more Rosemary. Yum! They look so fluffy and perfect. These rolls look so perfect. I love them! Those look delectable! I’ve never made potato rolls. I think I’m going to try them for Thanksgiving, but maybe with sweet potatoes. Happy Thanksgiving! 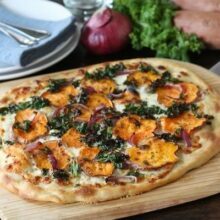 Let me know if you try them with sweet potatoes. They sound SO good! Those look great, Maria! Well done! 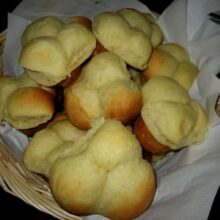 These are beautiful rolls Maria. I’m planning on making clover leaf rolls for Thanksgiving, but now I want to make this recipe instead. Potato bread is a favorite of mine because it’s so soft, the rosemary only makes these better. These look so good. I’m currently trying to settle on a few recipes for the thanksgiving celebration and these just made the list, definitely! i’ve decided potato bread is just about one of the finest things a person can put in her mouth. rosemary is the perfect herb to use too–well done! I always have trouble making rolls from scratch, but these look so good. I’ll have to give it another try. Just found your blog. What a cute couple. Those rolls look lovely! Love the rosemary in there… It’s not the holidays without some rosemary, if you ask me! I just love this potato rolls of yours, must really soft in texture! Beautiful! I like the idea of putting three balls into the muffin tin… they turn out so pretty. These look perfect, Maria! So soft and light. I think my dad would adore them. Wow they look soooo good! Glad you had a great time in California. just last night I told Ryan Rosemary is one of my favorite flavors! I once made a rosemary bread that we loved; I imagine I’d love these rolls as well! I love potato rosemary bread! I have made Peter Reinhart’s recipe a few times now and it’s fantastic. Your rolls looks amazing, and your photos are fantastic! Maria, these rolls look fantastic! Recipes like this one are made that much better by the fond memories that go with them. How many rolls does this recipe make? The recipe makes about 30 rolls. oh my gosh. those look and sound soo amazing. I’ve had potato rolls but, I never thought to add rosemary! YUM! I’m bookmarking this and can’t wait to make these! These sound delicious and I’ve love to try them, however it’s very hard to get shortening here in Australia. Have you ever tried the recipe with butter, and if so, how did it turn out? I have never tried the recipe with butter because my dad always uses shortening:) I am sure butter would work though. Please let me know if you try them! Thanks! I have never made potato rolls before. These look good. Rosemary is my absolute favorite herb. I know I would devour these rolls! Ohhh so beautiful! I JUST had my pull apart dinner rolls last night. We celebrated Thanksgiving early due to hubby going out of town. Hope you have a wonderful holiday my friend! These are beautifully perfect rolls. I LOVE bread all the time, but especially at Thanksgiving! Thanks for sharing! Beautiful Maria! 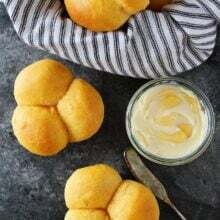 I love rolls and these look perfect for a Thanksgiving celebration! That rolls look amazing. 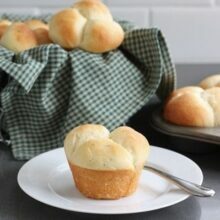 It’s close to lunch time now and looking to these wonderful rolls make me more hungry. If you don’t mind, I will try to make it with yellow potatoes, that kind of potate is very common and more used here in Peru. wow these are the prettiest rolls i have ever seen! they are perfect! i’m totally craving one now… with a nice big tab of butter… yummm!!! I made these rolls few days ago for a dinner I hosted. Everyone fell in love with them. It was a major hit, so big that I have to bake 3 dozens for one of my guests for their Thanksgiving dinner. I have rolls that I have always been famous for but these sound delicious! I’d like to try them some time soon. Thanks and Happy Thanksgiving! can you freeze these rolls after making? I will be making those real soon! Do you use leftover mashed potatoes with milk and butter or just use plain mashed potatoes? Thanks!! If I don’t have leftover mashed potatoes, I just make them without butter, etc. but if you have leftover mashed potatoes you certainly can use them!